When planning for your child’s future, many parents decide to set the right standards early on. Visual clarity and the ability to wear practical lenses can be an important part of a child’s young life, especially if they are already struggling with imperfect vision. 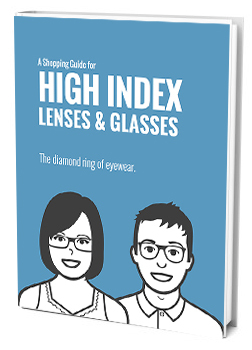 High index lenses aren’t just for adults, if your child has a strong eye prescription and you want to make sure their lenses are both very clear and fashionably slim, high index is a natural choice. Of course, buying glasses for your child requires a slightly different set of concerns than buying them for yourself. You’ll want the right index, material, and frames to ensure that their glasses can withstand as much activity as childhood has to offer. When determining the height of index you need for lenses, the strength of prescription should always be the most influential factor. Higher index lenses tend to be more expensive, but they are also much slimmer. The strength of the prescription determines the initial width of a glasses lens and each higher index will make the lens slimmer. This means that mild prescriptions don’t need very high indexes to become thin enough to fit into light-weight slender frames. However, if your child’s prescription is already quite extreme, higher index lenses will allow them to wear normal glasses without the coke-bottle edges and the appearance of eye distortion from the outside. High index lenses are better for strong prescriptions because they slim down thicker prescriptions. Weak prescriptions are already quite thin. The speed of eye deterioration or even simple change should also influence the choices you make on any individual pair of glasses. 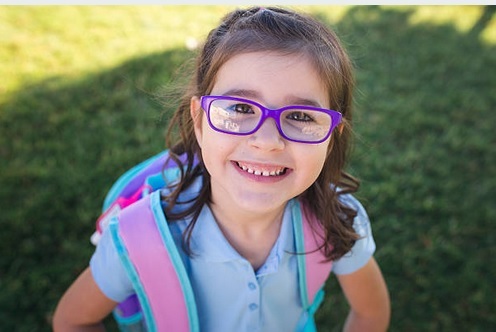 High index lenses are an investment in your child’s visual clarity and happiness at school, but each higher index is a larger investment in terms of cost. If your child’s prescription changes more than once a year, you will want to set your price range and find an index/material combination you like within that selection. However, children whose eyes don’t change often and only need a new prescription every one to two years may be able to get more from an investment in ultra-thin high index lenses. Higher indexes are more useful for children whose eyesight is relatively stable because the lenses can serve them for a longer time period before needing to be replaced. Children live more active lives than adults. Even the ones that you feel are always in front of the TV or computer still romp around at school, run when they have the chance, and play group sports games on the playground, during PE, and between school hours. Of course, some kids are more active than others and how their glasses are made should reflect that. If your child is always running, tumbling, and climbing on things, they will be better served by unbreakable lenses and possibly even rubberized frames that will bounce around safely with your child. More sedate children who can be careful with their glasses or have prescriptions weak enough to take off the eyewear when playing roughly can be trusted with more delicate lenses and frames if that’s what they want to wear. Plastic lenses are better for high-activity or even careless children to protect them from energetic mistakes like accidentally knocking off or sitting on their own glasses. You know your child’s glasses habits better than anyone. Are they always falling off or does your child keep them attached firmly to their face? Do they play rigorous sports that might lead to impacts or wrestle recklessly with friends? Anything your child does that could increase the chance of glasses taking impact damage should be considered from hockey to Frisbee. Certain plastic lens materials are made to be more impact and shatter resistant than others, sometimes up to bullet-proof resistance, and these will be a better bet for more active children. However, usually the standard polycarbonate lenses are sufficiently strong for anything children can (sometimes literally) throw at them. The next thing to consider when choosing a high index pair of glasses for your child is their own preferences. Your ideal thickness of lens will look right with the frames your child will select at the end of this process. Some like to try on every pair of small frames in the store while others will carefully select only the options that fulfill their personal criteria. Whatever they choose, the lenses that go in them will need to accommodate the style. Thick plastic frames can support thicker lenses, but you may need a high index if your child likes slender or wire-frame glasses. For rimless frames, you may need to select a super light-weight lens material so the frames can support them. If there’s one thing kid’s glasses see a lot of, it’s scratches. From everyday wear and tear, rough cleaning, pocket storage and the occasional tumble, children’s eyewear takes a lot of abuse even with the most careful children. However, once a certain amount of scratching occurs, the glasses lose any semblance of visual clarity and must be replaced. Most vendors can offer scratch-resistant coating for your child’s lenses to help reduce the number of scratches the lenses accumulate before it’s time to buy new ones. While this coating does eventually peel off, its lifespan is longer than most young children continue to wear a single pair of glasses. Now that you’ve covered what your child needs from a pair of high index eyeglasses, it’s time to consider possible additional features. When it comes to glasses, bonuses usually come in the form of lens coating. Like the scratch resistance, these coatings can add to the quality and functionality without changing the structure or material. Anti-reflective coating, for instance, is put on almost all high index lenses because the denser material tends to increase the chance that light will reflect off of them. If you live in a humid region, fog resistance can be a great coating for avoiding foggy glasses after moving between the inside and outside. UV protection guards your child’s eyes against harmful light but isn’t necessary for polycarbonate lenses which are already UV resistant. How your glasses are made is an incredibly personal experience, one that can shape your child’s youth permanently in either direction. Naturally, you want them to have both perfect visual clarity at school and be able to hold their heads high, proud of their new stylish glasses rather than stashing them at every chance. High index technology allows you to give them thin lenses, fashionable frames, and the ability to choose exactly the right pair for them. Whether they are active or quiet, bold or reserved, want flames on rubberized plastic frames or sleek shiny metal wire, they are now free to choose and so are you. Make sure that the next pair of glasses you get your child are designed at every level for their comfort, clarity, and personal sense of style.